So You Want to Improve Sales? If you’re looking to hire a sales consultant, then you’ve come to the right place. Sales Overdrive is a sales consultancy focused on integrating a vast number of targeted services and sales accelerators, each with supporting processes and methods proven to be best-in-class over seventeen years of successful client experience. “Over the years we’ve been able to assist hundreds of large and small companies increase sales and profitability in some very difficult times, and this sales consultant service represents a broader commitment to advisory services than we’ve been able to make in the past.” — Sales Overdrive CEO, Bob Howard. Sales Overdrive has long been recognized as the “partner of choice” for companies seeking sales consultants to help them grow sales and and improve the ROI on sales and marketing investments. We collaborate with our clients to develop an implementation plan that focuses on rapidly increasing top-line revenue growth and market share by providing tailored, time-tested sales consulting and acceleration services. Sales Overdrive Sales Consulting is the best choice for companies that desire high levels of revenue performance. Whether your company is operating in a very tough market, in a complex business-to-business sales environment or where sales is not a superior competency, Sales Overdrive is your smartest choice. Our focus is always on helping client companies achieve high performance levels in sales and marketing. The opportunities for top line revenue improvement are surprisingly large even for the best performing companies. Your opportunity, our approach, how we work with you, and the impact on revenue and your organization’s performance are described below. Of every 10 companies we see, only one is what we would call “High-Performing” with sustainable top-line growth and predictable sales and marketing. These companies seek higher and higher levels of performance and often seek Sales OverDrive’s sales consulting advice so as to stay on the top of their game. Of the remaining nine, only three are performing at what could be termed “Average” or “On Par” levels of growth. While significant improvement is possible with this group, it’s often out of reach for them. Getting incremental gains in areas that are working fairly well and making more substantive improvements in the areas that are underperforming is normally why these organizations seek us out. The remaining five are either “Stuck”, unable to achieve a breakthrough and begin growing again, or they are what we would call “Failing”, experiencing declining revenue and profitability. Most of the companies we see in this group can see dramatic improvement and ensure their sustainability by working with us. Because the opportunity for improvement is so widespread and often so elusive, in its 17-year history Sales OverDrive has been asked by 700 CEOs to provide them with sales help. 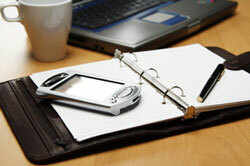 Our services are tailored and scalable. We want a win for each client no matter how large or small. So there are any number of ways we can help you. Three of them are listed in the section entitled “About Implementation” below. We start by working with the CEO or Sales and Marketing Leader and their teams in looking very closely at the core drivers of the business. We then tailor our efforts for their unique circumstances with the goal of helping them become a “High-Performing” company in their specific markets. What we’ve found is that there is a core group of 10 Core Drivers or “Core Revenue Drivers” that affect revenue growth and top line performance for every company we’ve seen. In addition, each of the 10 Core Revenue Drivers can be improved rapidly with the use some specific Key Accelerators. In total, there are 40 Key Accelerators that will be applicable to every company, three to six of which will have the greatest accelerating effect on those Revenue Drivers and, hence top line revenue performance overall. Several of these key accelerators are proprietary to Sales OverDrive. These Accelerators are designed to bring more speed and leverage to each of the 10 Revenue Drivers. So the Accelerators can have a big impact on a company’s velocity – bringing in top line sales much faster – than would be possible otherwise and, therefore, move the company into higher levels of performance and greater profitability much more quickly. So in working with our client company, we very quickly a) “Assess” the organization’s performance in these 10 areas, b) build a “Roadmap” for how and what to do in order to achieve greater performance and c) create a “Model” that includes the human and other resources needed to achieve that higher level of top line performance, and d) deliver a comprehensive implementation plan for executing all the activities and behaviors needed. In working with your company, we’re able to look at very specific areas of an organization’s performance in light of these Core Revenue Drivers and Accelerators and score and track their performance improvement over time. That not only gives us the ability to work very collaboratively with the company and identify what’s working well and where they might be stuck or failing, but what the metrics are and how they can be impacted. We can do this quickly, normally in a few days. 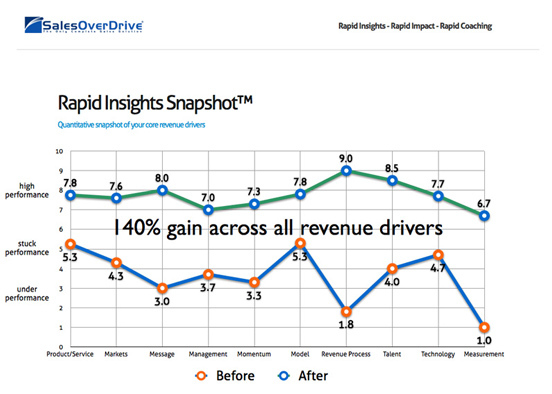 At the end of this relatively fast, collaborative effort we call Rapid Insights, we’re able to deliver some very high impact deliverables that CEOs, owners and leadership teams really like. The first deliverables are the Scorecard and Snapshot. The Scorecard is both qualitative and quantitative. It quantifies the Revenue Drivers in such a way that it is very easy to see in which areas the company is doing well and in which area the company needs some sales or marketing help. The Scorecard produces for us and the client company a very clear, quick “Snapshot” as to how the business is performing and some of the things that need to be addressed. It also gives us the ability to do some qualitative assessments, make observations and recommendations around all 10 Core Revenue Drivers and which of the Key Accelerators should be employed and in what order. 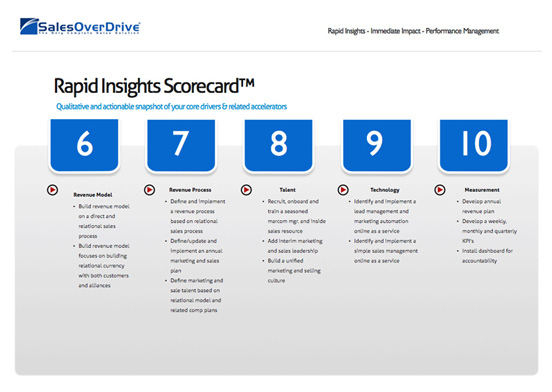 Sales OverDrive first developed this Scorecarding approach to looking at companies for CEOs, owners and management teams in order to give them a quick Snapshot into how the business is performing in these 10 areas. Company Executives and their teams are fond of this approach especially since it enables them to take a very low risk first step into better understanding how well their business is performing and very specifically where the gaps are. Equally important, it helps facilitate the very collaborative process of mapping out how to improve performance. This is an example page of a Scorecard and a before and after snapshot for a 1000 year old manufacturer for which we quintupled sales velocity. The second deliverable is the Roadmap. We look at the Marketing, Sales, Commutations and Service functions and make specific recommendations about what needs to be done in each of those company functions. We present a clear and precise pathway toward higher performance in the near, mid and long term. This is an example of a Roadmap overview. Thirdly, we deliver an Implementation Plan, sometimes referred to as a Project Plan. The Implementation Plan leverages the Scorecard and that clear path forward, the Roadmap, and specifically what should be done to move the company forward. The Implementation Plan is comprehensive and includes the Priorities, Activities, Resources, People, and Technology needed in the near-term, mid and long term to impact each of the Revenue Drivers and Accelerators, as well as a financial model predicting revenue and profitability increases over time. If you know our founder, Bob Howard, or any of the folks at Sales Overdrive, you know “We Don’t Do Random” and we don’t sell a “One Size Fits All” service as some do. 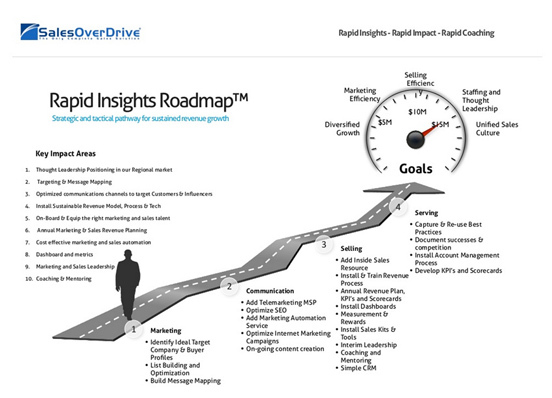 The Overdrive process model was built with this purpose: 1) Maximize our unique clients’ ability to bring in new, top line revenue and greater profitability 2) very great speed and 3) at the lowest possible cost 4) with the greatest and most positive impact on their markets and brand 4) with the lowest possible risk. So for us a WIN is to work with you and your team to improve your revenue performance rapidly and see your company grow top line revenue quickly and profitably. And to do so in such a way that your company has the greatest confidence of success, the correct and best resources focused on the most ideal markets and prospects using the best processes, exhibiting the behaviors and hitting the metrics that will bring your Roadmap to life and make your company a High-Performing sales organization. 1) Assign all the tasks associated with building and managing a sales (and often the marketing team) and all the execution and other day to day activities and responsibilities to Sales Overdrive, i.e., outsource the sales function to us. While we’ve performed more comprehensive B2B outsourcings than any firm we know of, our economic model is cost plus incentive so our objectives are in alignment with yours. 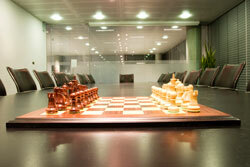 The only thing that we are dogmatic about is achieving top performance and ensuring your success. 2) Co-source the project with us, keeping the staff on your team while we provide the same help and assistance, training, tools and methods, coaching and mentoring, etc., that we would in scenario 1 above. Co-sourcing is becoming more and more popular. We recommend it for many companies that have an existing sales and marketing organization but are not achieving the best performance. So Sales Overdrive would augment your organization with a select group of Overdrive services and talented individuals. This often includes one or more Overdrive Interim Sales and Marketing Leader (normally an Overdrive Partner) which we make available to train, coach and mentor both the executive team and the and sales and marketing personnel, often in the field and on the phone. We are committed to help them perform superbly against pre-determined metrics and behaviors that are sustainable and predictive of revenue growth. 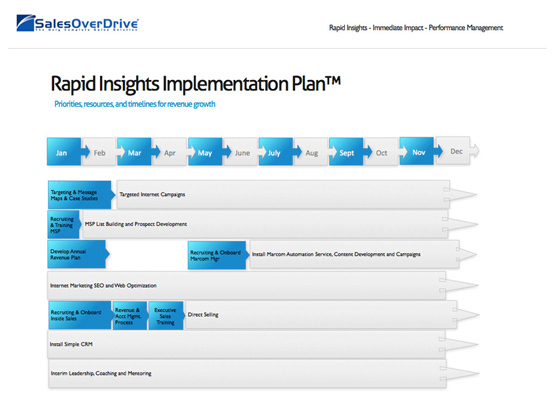 3) Perform the Implementation Plan yourself and have Sales OverDrive provide consulting on an as needed basis. Although less common, this is a normally a cost saving choice and can end badly unless Sales OverDrive is highly involved. Having done the careful thinking and planning described above, it only makes sense to deploy the best possible resources available. Smart thinking CEOs realize they “can’t save their way to glory (prosperity)”, so they hire the very best people and resources as we recommend. So a word of a word of caution is in order here. Sometimes a company will try to save a few bucks and essentially bet the company on a lone sales hire to execute the Roadmap and Implementation Plan that we build together with the client. This is normally a recipe for slow growth and great opportunity losses. Having the extended team of Sales Overdrive Partners and Managers focused on your business and assisting you execute the Implementation Plan on a fractional, and therefore very affordable basis, is a much smarter move. 4) Where you have severe budget constraints, spread the Implementation Plan out over a longer period of time or defer it to a later date and have Sales Overdrive provide you with ongoing coaching and mentoring on a fractional basis. This is a smart move because you will have access to the extended Overdrive team and many resources and centers of influence that you would not have otherwise. It’s slower going, but predictable, sustainable growth is always the result. If your sales organization represents a real competitive advantage over your competitors and you are completely happy with your top line growth, then you don’t need us. But if you want to become a High-Performing company with rapid top line sales growth with increasing profitability, revenue predictability and sustainability and a competitive advantage let Sales Overdrive help you. If you are a CEO, Owner or on the Management Team and want to take a first step into quantitatively measuring performance to see what improvements are available for your company, contact us today and we’ll get you started! Before engaging a sales consultant, check his or her experience in the real world. Note whether she’s an “in the trenches” kind of consultant or someone most comfortable working with senior management. Review her ability to close sales: watch her make a sales presentation and/or listen or participate in a phone sales call. Call references of those with whom the sales consultant has worked, and listen for “rave reviews.” Every company needs or wants higher sales, and a sales consultant with the ability to deliver is in great demand. Hiring a sales consultant may involve a significant expense to sales and marketing leaders. Senior management will no doubt communicate with the sales consultant. The sales consultant must have extraordinary communications abilities that rise above the sales team level. He must see the top-down world from senior management’s eyes while, in some cases, he works to generate sales from street level. The ability to quickly create working relationships within the organization is a highly desirable skill: the sales consultant probably won’t have years to make alliances. One of the most telling traits of the effective sales consultant is energy. Wherever he goes, people respond to the ability to move mountains if necessary. His energetic aura inspires upper management and sales team members alike. He naturally motivates others and never discourages them. People like to buy from him because they like him. The sales consultant certainly understands the client’s organizational structure and hierarchy. In addition, she knows how to seamlessly connect with senior level buyers at sales target or funnel organizations. She always presents opportunity on the basis of extensive research and planning. She succinctly introduces compelling sales opportunities to prospective buyers and existing clients. Of course, the sales consultant approaches the prospective relationship differently than she does the existing client. If the consultant’s goal is to add new accounts to her client’s sales organization, she identifies the most likely prospects. She executes with just the right amount of contact. Too much contact may alienate the prospect. When developing an existing client, the sales consultant approaches to simultaneously broaden and deepen the relationship. The professional sales consultant constantly communicates cause and effect. Deliverables, including hourly, daily, weekly, and monthly status reports, must communicate how effectively the consultant is meeting client goals. A deliverables discussion prior to engagement determines how the sales consultant plans to keep relevant sales team and senior management apprised of progress. Keeping sales expense to a minimum while maximizing revenue is a continuing challenge and focus for management in every company we see today. Many organizations look primarily at total selling expense and ROI on sales and marketing investments to the exclusion of other equally important metrics and considerations. For example, companies fortunate enough to be first to market with new products and services may enjoy market leadership for a time, but the long-term race requires strategy and processes that focus on customers, speed and execution as competitors enter the market. So as execution requirements increase, short-term expense and ROI constraints require adjustment. Increasing needs to anticipate and respond to the market with agility and to execute forcefully invariably require increasing investments in excellent talent and and other resources. During the last decade, one out of every five companies in the United States between $1 Million and $100 Million in revenue we surveyed had serious sales performance issues in most industry groups. These “Failing” sales organizations were typified by slow or nil new customer acquisition rates, frequent customer turnover, pricing and competitive pressures, sales team turnover and an inability to replicate successes. In the last two years our surveys indicate that the number of failing companies in this revenue range has increased to as many as three of five companies. Although most of these companies have tenured sales and marketing teams, many will never develop the customer relationships, sales processes and tools needed to survive, much less thrive, without significant changes to their sales organization. There are many elements of a successful sales and marketing program for organizations desiring sales optimization. Some of these include a winning sales and marketing strategy, mutually beneficial partnerships and relationships, world-class sales and marketing talent, best-in-class processes, effective lead generation, the advantageous use of technology and stellar marketing creative efforts. Normally, however, it is the financial metrics that are the focus. This is where strategic sales consulting can really help. Everyone will agree that having an outstanding sales and marketing strategy is critical to any company’s success, but not everyone appreciates exactly what that means. A strategic sales and marketing roadmap increases the probability of success dramatically by providing unmistakable metrics – not merely financial metrics – to track progress in obtaining market share, outpacing the competition, developing customer intimacy and increasing revenue. This strategic plan should identify the means to build and execute growth strategies consistent with management’s vision and enable the company to capture new opportunities and rapidly grow market share. It should target the markets and prospects with the most potential and market momentum given the competitive landscape. Moreover, it must focus on the alignment of the best prospects with the value your products and services can deliver. A winning Strategy will include the most compelling positioning and messages that address the target market decision-makers’ key agendas. Channels must also be addressed — determining the most potent, resource-efficient options for delivering the message to the market, as well as developing a pricing structure that brings the best margins possible. While financial metrics can’t be ignored, many other indices are equally or more important such as those that are track behavior and ensure it is predictive of revenue and financial success for the organization.